The year is going fast and Im busy with www.not.mytempoband.com performing around Washington. This month we have gigs at the Snovalley Eagles club and then at Rock The Dock. Both are gigs that we also have repeated in December PLUS we are back to NW Brewing (in December). [EDIT 11/13/2016] - Had a great time playing our first gig at Snovalley Eagles. Really warm and welcoming club who are trying to build live music as a monthly event. We are back there for New Years Eve - and maybe even something sooner if we can fit it into our schedule. One of the highlights was playing 4 new songs for the first time….Love Rollercoaster, Disco Inferno, Running Down A Dream, Margarittaville. On the bass front I’ve been learning a few new tunes - Disco Inferno and Love Roller coaster. Both are fun tunes that I am looking forward to playing live. 1. 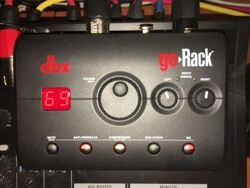 Just picked up the DBX Go-Rack, A really neat little device to help control feedback and add compression. 2. To add the ‘radio voice’ to Love Rollercoaster (think RHCP version), I just purchased a Behringer EQ stomp box that Im hoping I can use the cut out all the frequencies < 1 K and above 3K. I will write a bit more on the success or …otherwise… of this pedal. I have a couple of regular students who are doing extremely well and are an absolute pleasure to teach. Its great to get back into teaching. Im even thinking about purchasing a ‘loaner’ bass for new students to take home while they decide if they want to commit to regular lessons.